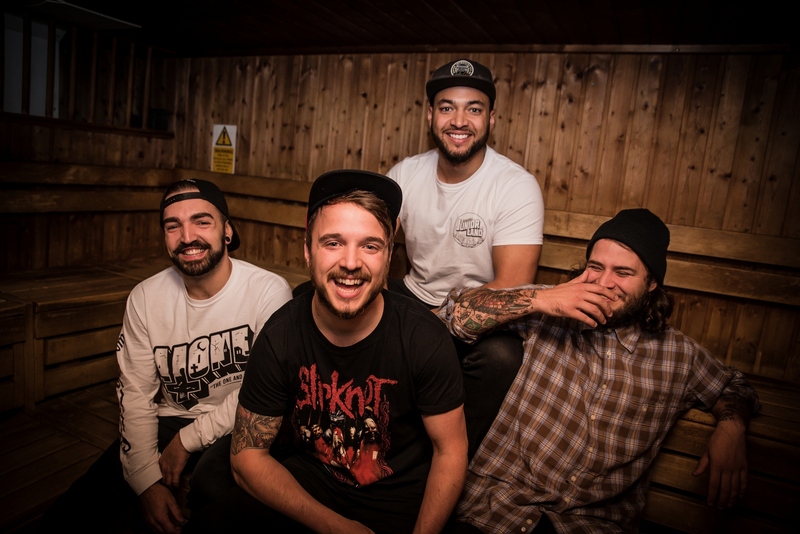 Highly rated Swindon based pop-punkers As The Sun Sleeps unveil their brand new EP As Good As Gold, which arrives in stores on Friday 20th January 2017. The band chat about what they have in store for the coming weeks and beyond…..
We see the band forming properly when Trees joined in December of 2014, we’d released an EP as a 3 piece before that while looking for a fourth member, but, we knew we could never play live or move on without the final piece. Tshrimp and Joe started things off after a chance meeting at a works game of football, Joe was working on a really terrible acoustic project and for some reason Tshrimp saw something in it and the two started working on songs together. A little while down the line Broady joined after inviting us to demo in his friends studio, he instantly showed an interest in the music and it was clear he was the perfect fit. The first EP we released was recorded in that studio, Trees heard it, dug it and shared it on FaceBook, as soon as he did we jumped on him and asked him to join the band on lead guitar. There have been a few occasions along our journey so far that hold significance, the biggest being our first tour, I think that was a massive “we can do this” moment for all of us and really lit a fire. After that we went onto write the new EP, everyone gelled together and put their stamp on it like never before, we’re starting to realize what our style is and mould our sound to something we’re really psyched with. Joe’s been listening to pop punk since 2003 none stop, he really never grew up, so a lot of his influence comes from the original pop punk explosion, bands like Cartel, Yellowcard, New Found Glory and Motion City Soundtrack. But the band is fairly diverse, Tshrimp is really into his math rock, bands like Tangled Hair and Delta Sleep. Trees was inspired to play guitar by The Cardigans and grew up listening to pop-punk along with guitar legends like BB King and Garry Moore. What promotion you have received up until now? Our video for “Digging Deep” was in the rotation on Scuzz TV, we’ve also had an “on the radar” piece printed in Rock Sound magazine. We’re endorsed by Alone Clothing and we’ve have various coverage from websites such as Punk News, Punktastic, Alt Corner, Moshville and a bunch more. We think there is a couple of things that make an “As The Sun Sleeps” song different, we have very defined lead and rhythm guitar lines, at no point in any of our songs are they doing the same thing. Also we have a metal drummer who loves math rock, Tshrimp comes up with some pretty funky stuff you don’t hear on most pop-punk records. Oh man, that’s hard! We get likened to New Found Glory all the time and we joke around calling Trees the “Slash” of pop punk because of his guitar playing style, so maybe we sound like if Slash was the lead guitarist for New Found Glory?! Yes, we’ll be out on the road towards the end of January 2017, we’ve booked half a 9 day tour and we’re in the process of finalising the other half, so keep an eye out for news on that. Next It’s Aerosmith, Biffy Clyro and System of a Down for Download Festival 2017!